Our in-house designed Aerite™ AB135 Aquaculture Feed Blower is engineered as a high volume, low-pressure centrifugal blower to maximize the bulk transfer of dry, breakable materials. The Aerite™ AB135 model consists of a 35.0 cm (13.5 inch) cast Almag® impeller matched to a cast Almag® backing plate, and an engineered blower housing fitted with an inlet shroud designed to protect operators from injury while maximizing the movement of air and blower operating performance. Machined and statically balanced components are designed for maximum versatility and may be mounted on gas, diesel, electric, or hydraulic motors. To reduce wear and maintenance costs associated with pulleys and belts the Aerite™ AB135 Blower is produced as a direct drive blower unit with the associated benefits of compact size, lightweight, and portability. Aerite™ AB135 Blower units are commonly matched with our AeroSpreader™ S125 and S250 model dry pellet aquaculture feeders to create a high performance feed pellet-broadcasting package. 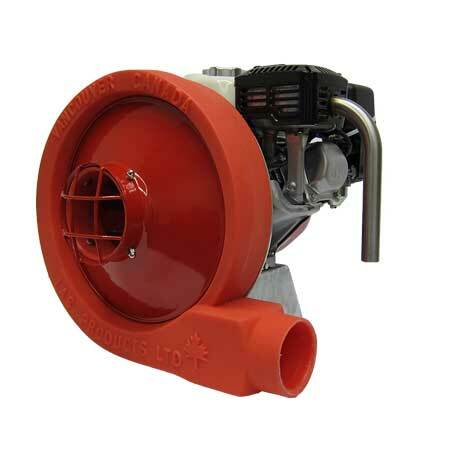 Trouble free long life operation is assured with the UV stabilized polyethylene blower housing well-suited for tough outdoor and corrosive work environments. The blower’s simple assembly design allows the unit to be easily separated from the power plant and re-installed on any comparable sized motor assembly. Both the inlet horn diameter and carefully shaped internal impeller tip clearances are optimally designed to provide high static pressure at very low operating noise. Eliminates the time and expense of maintaining belts. Smooth operation a high speed. UV stabilized polyethylene housing will resist the worst operating environments. Almag® cast and machined impeller ensures product-operating longevity. 19 mm (0.75 in) hub and 4.7mm (0.1875 in) diameter shaft key. Dynamically balanced. Cast Almag® 39 cm (15.5 in.) diameter. Machined, mounting bolt pattern allows for alternate power sources. UV stabilised rotational molded polyethylene. steel inlet horn and safety screen. 10 cm (4.0 in) diameter. 5 Kw (6.5 HP) Gx200 Honda power plant with low oil alert.